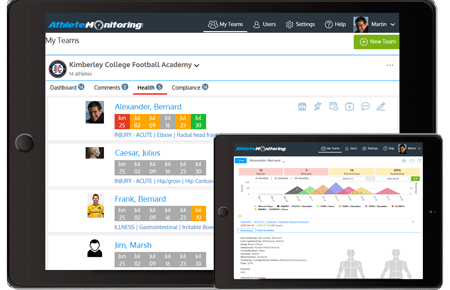 AthleteMonitoring introduces its new medical, health monitoring and injury surveillance module. Built in collaboration with the Oslo Sport Trauma Research Center, it combines the most accurate injury surveillance methodology available today, a full-scale EMR system and powerful reporting tools. Easy to use by both athletes and health practitioners, this innovative tool will help you detect all injuries and illnesses, record diagnoses, clinical notes, manage medical records and produce injury reports, graphs and statistics instantly.